Knox County is a county in the U.S. state of Tennessee. As of the 2010 census, the population was 432,226, making it the third-most populous county in Tennessee, and the 153rd-most populous county or county-equivalent in the nation. Its county seat is Knoxville, the third-most populous city in Tennessee. Knox County is included in the Knoxville, TN Metropolitan Statistical Area. The county is at the geographical center of the Great Valley of East Tennessee. Near the heart of the county is the origin of the Tennessee River at the union of the Holston and French Broad rivers. Knox County was created on June 11, 1792, by Governor William Blount from parts of Greene and Hawkins counties, one of the few counties created when the state was still known as the Southwest Territory. It is one of nine United States counties named for American Revolutionary War general and first United States Secretary of War Henry Knox. Parts of Knox County later became Blount (1795), Anderson (1801), Roane (1801), and Union (1850) counties. In 1783, an expedition into the Upper Tennessee Valley led by James White and Francis Alexander Ramsey explored what is now Knox County. White moved to what is now the Riverdale community in the eastern part of the county in 1785, and the following year constructed a fort a few miles to the west that would evolve into the city of Knoxville. Blount chose the fort as the capital of the Southwest Territory in 1790, and gave the new town the name "Knoxville" after his superior, Henry Knox. Blount began construction of his house, Blount Mansion, in the early 1790s. The house still stands in downtown Knoxville. The Alexander McMillan House, built in the mid-1780s by Alexander McMillan (1749–1837), still stands in eastern Knox County. The Alexander Bishop House, built by Stockley Donelson in 1793, and a log house built in the same year by Nicholas Gibbs, both still stand in the northern part of the county. Campbell's Station, a fort and stagecoach stop located in what is now Farragut, was built by Captain David Campbell (1753–1832) in 1787. John Sevier established a plantation, known as Marble Springs, in the southern part of the county in the 1790s. Knox County's strategic location along important railroad lines made it an area coveted by both Union and Confederate forces throughout the Civil War. Since the mountainous terrain of East Tennessee was mostly unsuitable for plantation crops such as cotton, slavery was not as prevalent as it was in Middle and West Tennessee - an 1860 census of Knox County showed a population of 20,020 white citizens and just 2,370 enslaved African Americans. The lack of slavery combined with the vestiges of a once strong abolitionist movement in the region were two of the reasons that Knox County, along with much of East Tennessee, contained a great deal of pro-Union sentiment. In February 1861, 89% of Knox Countians voted for the pro-Union ballot in a statewide referendum on secession. On June 8, 1861, the county voted against Tennessee's Ordinance of Secession by a margin of 3,108 to 1,226. Prior to secession, Unionists from Knox County collaborated with other East Tennessee Unionists in an attempt to secede from Tennessee itself and remain part of the Union. Oliver Perry Temple, a Knoxville lawyer, was named to a 3-man commission to appear before the General Assembly in Nashville and request East Tennessee and pro-Union Middle Tennessee counties be allowed to secede from the state. The attempt failed. Knox County joined the Confederacy along with the rest of Tennessee after the second referendum for secession passed in 1861. 'Glory be to God, the Yankees have come! The flag's come back to Tennessee!' Such were the welcomes all along the road, as we entered Knoxville, it was past all description. The people seemed frantic with joy. I never knew what the Love of Liberty was before. The old flag has been hidden in mattresses and under carpets. It now floats to the breeze at every staff in East Tennessee. Ladies wear it -- carry it -- wave it! Little children clap their hands and kiss it. 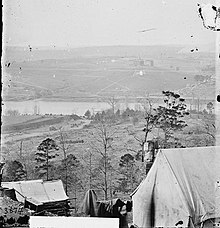 With the success of Burnside's troops in the Knoxville Campaign, and especially during the decisive Battle of Fort Sanders, Knox County remained under Union control for the duration of the Civil War. In the late 19th and early 20th centuries, Knox County played an important role in the quarrying and finishing of Tennessee marble, a type of limestone used in monument construction across the United States and Canada. Eleven quarries were operating in Knox County in 1882, and within ten years that number had doubled. Notable quarries in Knox included the Bond Quarry in Concord, an Evans Company quarry near Forks-of-the-River, and the Ross-Republic quarries near Island Home Park in South Knoxville. Finishing centers were located in Lonsdale and at the Candoro Marble Works in South Knoxville. According to the U.S. Census Bureau, the county has a total area of 526 square miles (1,360 km2), of which 508 square miles (1,320 km2) is land and 18 square miles (47 km2) (3.4%) is water. The county lies amidst the Ridge-and-Valley Appalachians, which are characterized by long, narrow ridges, oriented northeast-to-southwest, alternating with similarly-shaped valleys. Notable ridges in the county include Bays Mountain, McAnnally Ridge, Beaver Ridge, Sharp's Ridge and Copper Ridge. House Mountain, at 2,064 feet (629 m), is the county's highest point, and is the focus of a state natural area. The Holston and French Broad rivers join to form the Tennessee River in the eastern part of the county, an area known as "Forks-of-the-River." This section of the river is part of Fort Loudoun Lake, which is created by Fort Loudoun Dam several miles downstream in Lenoir City. Cherokee Caverns is located 14 miles west of Knoxville on Highway 62. It was discovered in 1854 by Robert Crudgington who noticed fog emerging between rocks on his farm. He dug the entrance open and explored the cave. His daughter Margaret Crudgington opened the cave to the public in 1929 under the name Gentrys Cave, then changed the name to Grand Caverns in 1930. The cave has been open to the public, sporadically, ever since, under a variety of names. The name currently in use is Cherokee Caverns. Indian artifacts located in the cave indicate that another entrance to the cave existed at some time in the past. As of the census of 2000, there were 382,032 people, 157,872 households, and 100,722 families residing in the county. The population density was 751 people per square mile (290/km²). There were 171,439 housing units at an average density of 337 per square mile (130/km²). The racial makeup of the county was 88.10% White, 8.63% Black or African American, 0.26% Native American, 1.29% Asian, 0.03% Pacific Islander, 0.50% from other races, and 1.18% from two or more races. 1.26% of the population were Hispanic or Latino of any race. There were 157,872 households out of which 28.50% had children under the age of 18 living with them, 49.80% were married couples living together, 10.90% had a female householder with no husband present, and 36.20% were non-families. 29.60% of all households were made up of individuals and 9.10% had someone living alone who was 65 years of age or older. The average household size was 2.34 and the average family size was 2.92. In the county, the population was spread out with 22.30% under the age of 18, 11.60% from 18 to 24, 30.40% from 25 to 44, 23.10% from 45 to 64, and 12.70% who were 65 years of age or older. The median age was 36 years. For every 100 females, there were 93.50 males. For every 100 females age 18 and over, there were 90.10 males. The median income for a household in the county was $37,454, and the median income for a family was $49,182. Males had a median income of $35,755 versus $25,140 for females. The per capita income for the county was $21,875. About 8.40% of families and 12.60% of the population were below the poverty line, including 14.50% of those under age 18 and 9.70% of those age 65 or over. The government of Knox County, Tennessee operates under a home rule format. The county administrator, formerly known as the County Executive, is called the County Mayor. The current county mayor is Glenn Jacobs, better known by his WWE identity of Kane. There is also an elected county commission, which consists of 11 members. Knox County is divided into nine commission districts, with one commissioner elected from each district. Two commissioners are elected countywide and serve as at-large representatives. The county commissioners' districts do not correspond with those of the city of Knoxville, which has its own mayor and city council. Residents of the county living within Knoxville city limits vote in both city and county elections, are represented by city and county mayors, and pay city and county taxes. While the administration appears to be duplicated, services tend to be separated. Knox County runs the local school and library systems. Knoxville maintains a police department independent of the county sheriff. The property assessor's office, tax offices, and the Metropolitan Planning Commission are combined between the city and county governments. All Knox County elections are conducted on a partisan basis. The county mayor is the head of the executive branch of Knox County Government. According to the county's charter, the mayor is the chief financial officer of the county, which includes developing the county's annual budget, approving county contracts, etc. Other responsibilities of the county mayor's office include maintaining county roads, highways and bridges, codes enforcement and operating the county's health department and library system. The mayor has the authority to veto resolutions and ordinances passed by the Knox County Commission. A majority-plus-one vote is required to override a mayoral veto, unless the vetoed legislation was required to have a two-thirds vote for original passage. In such cases, a two-thirds vote of the commission is required to override the veto. The Knox County Board of Commissioners is the legislative body of Knox County and consists of 11 members: nine elected at the district level and two elected countywide to serve at-large. Commissioners meet multiple times each month, with their primary business meetings being a monthly work session and a monthly voting meeting. During the work session, commissioners generally debate items on the monthly agenda and take a non-binding vote on each item in advance of the more formal voting meeting, which is generally held the following week. The Board of Commissioners approves resolutions, ordinances, honorariums, road names, as well as most county contracts and large expenditures. Resolutions require a single vote for passage, while ordinances require two votes, or "two readings". The County Commission also serves as the appropriating body of the county and must approve an annual budget—presented by the mayor—which includes funding for the various county departments, including the Knox County Schools. The body also sets the property tax rate for the county. The Knox County Sheriff serves as the top law enforcement office of the county, and is elected countywide. The sheriff is responsible for overseeing the county jail, providing courtroom officers, serving warrants and providing general law enforcement functions, such as patrol and criminal investigation. Knoxville Area Transit provides city bus service, while McGhee Tyson Airport features a variety of regional flights to Midwestern and Southern cities. ^ a b Steve Cotham, "Knox County," Tennessee Encyclopedia of History and Culture. Retrieved: 18 October 2013. ^ Gannett, Henry (1905). The Origin of Certain Place Names in the United States. Government Printing Office. p. 177. ^ Stanley Folmsbee and Lucile Deaderick, "The Founding of Knoxville," East Tennessee Historical Society Publications, Vol. 13 (1941), pp. 3-20. ^ The Wonderful 18th Century House of Alexander Bishop. "Ask Doc Knox," Metro Pulse, 9 August 2010. Accessed at the Internet Archive, 2 October 2015. ^ Nicholas Gibbs Historical Society website. Retrieved: 18 October 2013. ^ Doris Woods Owen, Kate Clabough, Concord-Farragut (Arcadia Publishing, 2009), p. 32. ^ Carroll Van West, "Marble Springs." The Tennessee Encyclopedia of History and Culture, 2002. Retrieved: 4 April 2008. ^ a b Tumblin, J.C. "Knoxville in the Civil War". Retrieved 2008-08-09. ^ Eric Lacy, Vanquished Volunteers: East Tennessee Sectionalism from Statehood to Secession (Johnson City, Tenn.: East Tennessee State University Press, 1965), p. 217 (Appendix B). Oliver Perry Temple (East Tennessee and the Civil War, p. 199) gives the margin as 3,196 to 752. ^ "Furman:East Tennessee Anti-Secession Resolutions". Retrieved 2008-08-09. ^ "Ordinance of Secession of Tennessee". Archived from the original on 2012-02-06. Retrieved 2008-08-09. ^ John Wooldridge, George Mellen, William Rule (ed. ), Standard History of Knoxville, Tennessee (Chicago: Lewis Publishing Company, 1900; reprinted by Kessinger Books, 2010), pp. 204-206. ^ Charles Gordon, The Marbles of Tennessee (State of Tennessee Geological Survey, 1911), pp. 5-33. ^ House Mountain State Natural Area, Tennessee Department of Environment and Conservation. Retrieved: 19 October 2013. ^ a b "Caves of Knoxville and the Great Smoky Mountains" by Larry E. Matthews, 2008, ISBN 978-1-879961-30-2, Published by the National Speleological Society, Chapter 1 - Cherokee Caverns, pages 17-36. ^ "U.S. Decennial Census". United States Census Bureau. Archived from the original on May 12, 2015. Retrieved April 7, 2015. ^ a b c d e "Knox County Charter". Municode.com. Retrieved April 21, 2013. Wikimedia Commons has media related to Knox County, Tennessee.